Microsoft’s hard push to Office 365 is causing IT organizations worldwide to re-evaluate their decisions – especially the need for on-premise servers and legacy infrastructure. The answer is yes – but first let’s understand why Microsoft has moved to Office 365. In 2012, Microsoft Office had a whopping one billion users. But Google Apps for Work was breathing down Microsoft’s neck, with their competing Docs and Sheets at use at millions of companies (and growing). So the move to O365 is being driven by Microsoft’s desire to compete with Google Apps. But it’s also about their desire to lock-in their customers with a subscription pricing model. The ability to get customers paying month after month has turned O365 into one of Microsoft’s crown jewels. That isn’t to say that Office 365 is a bad deal for businesses. Overall, businesses benefit from Office 365 too, saving 27% in cost savings [BetterCloud]. Migrating to O365. Can AD Come Too? While the benefits of Office 365 are significant, challenges remain. One of the most pressing is whether Active Directory should move to the cloud or not. The migration from on-prem technology to the cloud is big step forward for IT organizations. Business gets done more quickly and seamlessly on the cloud. It scales automatically and effortlessly. There is no longer a need to manage and maintain on-prem servers, software, and the associated equipment to run those servers for users. A prime example of why many organizations are moving to O365 is email. Microsoft has historically sold their on-prem Exchange server, but with O365, they are saying to customers, “We’ll manage that service for you.” IT admins no longer need to set up servers, storage space, redundancy, and all of the other associated items with running their own email service. With the rest of the O365 platform, that move is about the Office productivity suite. End users can leverage the cloud application or leave it on their device, but storage can be in the cloud. Of course, this is all analogous to Google Apps, which counts millions of business customers. With the productivity suite moving to the cloud, the Microsoft companion product to Exchange, Active Directory, is remaining on-premises. That’s just how AD is built. In order to fully control and manage all of an organization’s on-prem Windows systems and related solutions, Active Directory needs to stay on-prem. The cloud Azure Active Directory product is not an alternative – it is a ‘mini-directory’ that manages Azure and O365 users. So, now IT organizations have one camp in the cloud and another on-prem with AD. That’s a difficult spot which requires significant multi-tasking of approaches. The answer to that question is yes, but it isn’t delivered by Microsoft. JumpCloud’s Directory-as-a-Service® platform is the answer to completely shifting your productivity platform to O365 without maintaining Active Directory. 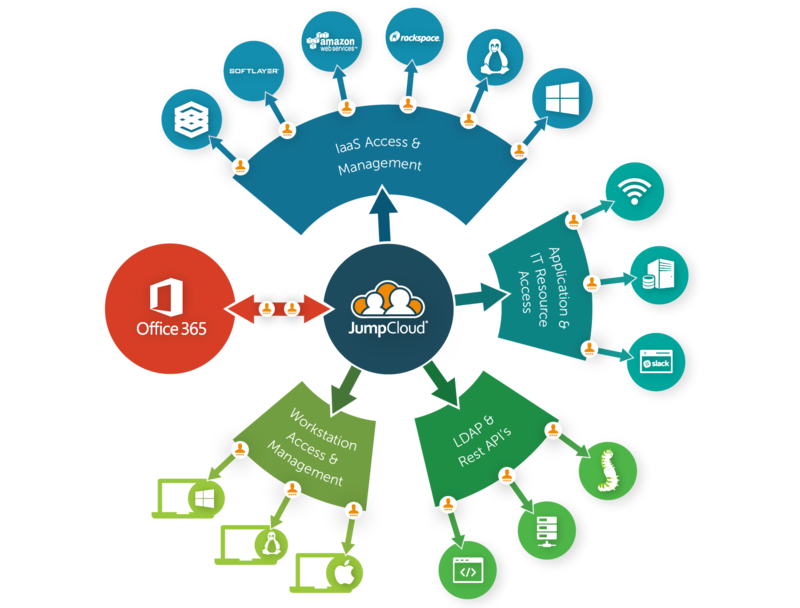 JumpCloud’s cloud-hosted directory service integrates tightly with O365, enabling full user management there and with on-prem devices. The best part about JumpCloud is that it is completely independent. That means that whether you are using Windows, Mac, or Linux devices it has the same capabilities – all platforms are treated as first class citizens. Your organization may use GApps alongside O365, or perhaps AWS. That’s also no problem for our virtual identity provider. In fact, JumpCloud is platform agnostic, multiprotocol (supporting LDAP, SAML, RADIUS, SSH, and MFA – we realize the last two aren’t technically ‘protocols’), and location independent. In short, it’s a modern directory service. 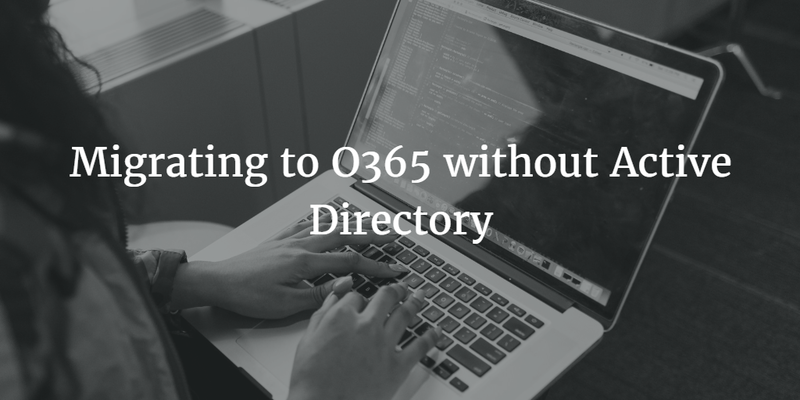 If you are making the move to O365, but are thinking hard about what to do with Active Directory, drop us a note. We’d be happy to chat with you about your options and whether our Directory-as-a-Service platform is right for you. Or, if you are inclined, sign-up for a free JumpCloud account. Your first 10 users are free forever.